A superb modern 5-bedrooms in one of the most beautiful areas of south west Turkey. Set in a quiet residential area of the town, the villa is fitted out to the highest standards. Dalyan is set on the winding Dalyan River that flows between the Mediterranean Sea and Lake Koycegiz.The town is a short 5 minute walk from the villa and offers a wide range of shops and riverside restaurants to suit every taste. A short boat ride will take you to the beautiful Iztuzu (Turtle) Beach. The villa has been individually furnished to a very high standard with all modern amenities including air conditioning, marble floors, balcony's in every room and a well equipped bathroom.Kitchen is fully equipped with fridge, washing machine, dishwasher, oven and hob, electric kettle and toaster. Ground Floor: Open plan kitchen with large sitting room which have 2 sofas and 2 arm chairs, There are 3 bedrooms,First bedroom has 3 single beds .Second bedroom has a big size bed and the other bedroom have 2 single beds,one big size bathroom which has shower and wc and There is a lavatory.Kitchen and one of the front bedroom is opening to large terrace. First Floor: Open plan kitchen with large sitting room which have 2 sofas and 2 arm chairs, There are 2 bedrooms,First bedroom has 2 single beds .Second bedroom has a big size bed .One big size bathroom which has shower and wc Each bedrooms are opening to large balconies. Will consider: Long lets, or minimum 3 nights. Suitable for people with restricted mobility but not wheel chairs. Other: Linen provided, we provide towels for bathroom and swimming, to save your suitcase space. Outdoors: Balconies, Terrace and a private garden around the pool. Access: Parking space in the garden. The garden is well maintained with mature shubs and flowers, also a green lawn. There is plenty of parking space and views towards the ancient Lycian Rock tomb. If you do want to travel around the area a car or scooter is easy arrange and very cheap.. we also have the local Saturday market in town each week within minutes from the apartment....Transfers can also be arranged. •Direct Flights (from all over Europe . •Distance to nearest hospital: 1km. •Gocek marina & port: 30km. •Dalaman marina & port: 25km. •18 Hole International Standard Golf Courses: 20km. Guests are welcome to all the outside space which will be theirs entirely. The ground floor has an additional room should you be a larger group. An extra two people could stay in the ground floor.I will be on hand to help with any problems or advice. I work in the town and can be always be accessed on my mobile phone. having lived in Dalyan all my life, i know a lot of local spots to recommend you. It is my wish to make your stay as interesting and relaxing as possible. 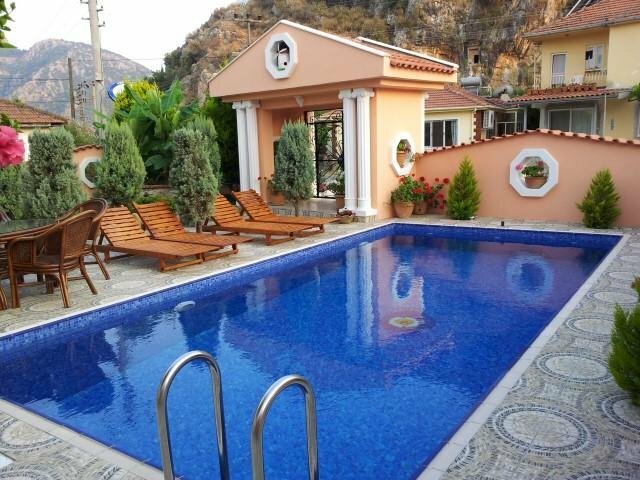 The house has very good views of surrounding mountains, from the top balcony you can see a view of the main rock tombs which make Dalyan famous. The area is cool as the breeze blows off the mountains. There is a regular bus to Iztuzu beach which passes directly past the house every half hour.. Iztuzu is only 10 minutes by bus. I arrange regular boat trips on lake, to Sultanye, the ancient hot springs, bird watching on the lake and to Koycegiz market…also to the beach at Iztuzu. For my guests i will offer a discount. the boats leave from the river, a five minute walk. July and August are the busiest times in Dalyan but in Dalyan Palace, you will find a quiet haven away from the crowds. This wonderful airy space overlooking its swimming pool is the realisation of my dream house.